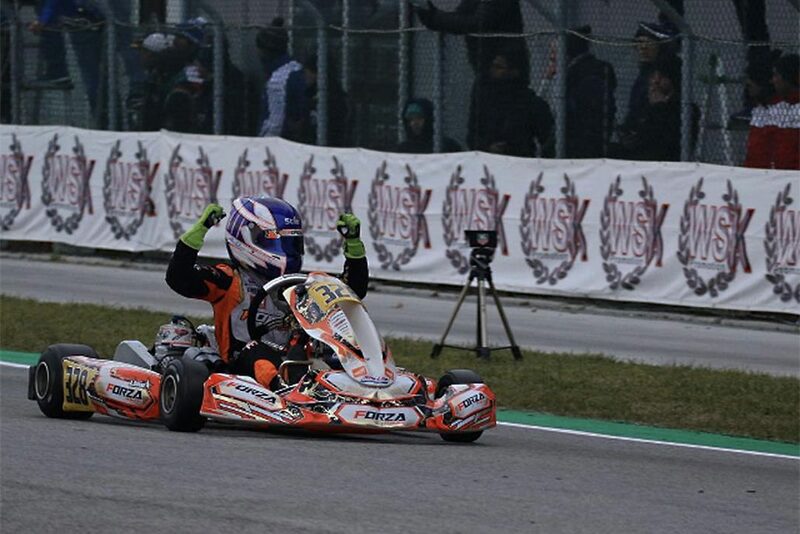 Alex Dunne once again lived up to his billing as Ireland’s top International Kart Racer as he kicked off his 2019 season in style in Adria, Italy. Racing in the one-off WSK Champions Cup race, the thirteen year old Newbridge College student took his first ever outright European win as he dominated the final of the ‘OKJ’ Junior category. Having made his début in the WSK series in 2018, Alex was knocking on the door of a maiden win all through last season. Strong performances saw him take heat wins and fastest race laps, but the outright win never quite came. Going into this season, his first aim was to take victory in a final and with that already achieved the youngster will head back to Italy next week full of confidence for his first championship race of the year. The Champions Cup weekend began steadily for Alex as he took eighth place in qualifying, from more than fifty drivers, giving him a second row start for each of his four heats. The youngster was then on top form in his first heat as he hit the front by the end of lap one and was never headed, getting his season off to the best possible start. Heat two saw Alex again running at the front before a last lap sort out dropped him to fourth place. Heat three proved to be the toughest so far for the youngster as he took till half distance to work his way into second place. By the time he did, the leader was two seconds up the road and he had to settle for the runner-up spot and another podium finish. The final heat saw the Irishman make his worst start of the weekend dropping him to sixth, but an excellent fightback saw him again finish in fourth place less than two tenths of second off another podium. Dunne’s impressive run through the heats was good enough to clinch second on the grid for his pre-final, which would decide the grid positions for the final. Following yet another good getaway, a fast and consistent race saw him retain his starting position as he came home second, well clear of the third placed driver, to secure a second row start for the final. The final had the biggest and most competitive field of the weekend with the thirty four fastest drivers taking part. Alex was un-fazed by the additional competition and was once again in determined mood as he took second place right from the start. Having been briefly bumped back down to third he then got into his stride as he moved back into second and closed on the leader, before taking over at the front on lap six. Over the remaining ten laps the teenager built a big enough lead to allow him to ease off and control the gap as he cruised to his maiden outright win. Alex Dunne heads back to the scene of his victory in less than a week, as he returns to the Adria circuit for the first of four rounds of the WSK Super Masters Series.